Taking the alternative grunge sound that they explored on Floral Green, tweaking it and recording it to analog tape was the best possible move for the veterans. Will Yip is once again at the boards lending his god-like touch to Title Fight's 90's-esque pallete which amplifies all of the guitar twangs and thumping drums perfectly. Opening track "Blush" is riffy and grungy, backed by Ned Russin's trademark wails. The harsh screams blend seamlessly into the music which mixes the hard alternative rock feel of Floral Green with the edge and angst of Shed. The mid-tempo "Be A Toy" switches to Jamie Rhoden on the mic who swoons listeners with airy, contemplative lyrics. The lofty and almost dreamlike quality of his delivery paints a special backdrop in the chorus, "And I said don't throw it away/I don't want to be a toy forever." A buzzy clean guitar rolls over stomping drums as "Receiving Line" pushes into slow 90's emo territory. It's much more stripped down compared to the other tracks, and effectively so. The jam track evokes the feelings of a first snowfall on a late night drive or the long drag of a joint in a dim basement with friends. "I'm sorry for your loss, you probably get that a lot/we didn't have to talk, you probably get that" drives a sense of loneliness spindled with reflective self-deprecation. If Tigers Jaw wanted to take grunge in a new direction, "Receiving Line" would be the result. Just when you thought it couldn't get any better, "Hypnotize" hits full blast with a dissonant mid-tempo crusade. Jamie's back at the helm with his lazy delivery, but it meshes so well with the tune you'd swear that Title Fight were lost legends from 1995. The guitar riffs tumble back and forth, yanking your mind between the otherworldly and all things reminiscent. It feels familiar and fresh and by the time the last 30 seconds roll around and the guitar outro closes, you'll be hooked. Flip the record and listen all over again. Looking at Title Fight's career beginning with their Lifetime-like pop punk of The Last Thing You Forget to the complex alt-punk of Spring Songs can be startling. Sure, Floral Green received great praise and many reviewers lauded the band's new direction, but Spring Songs makes the last release look like a demo. These four tracks are what Floral Green could have and should have been. 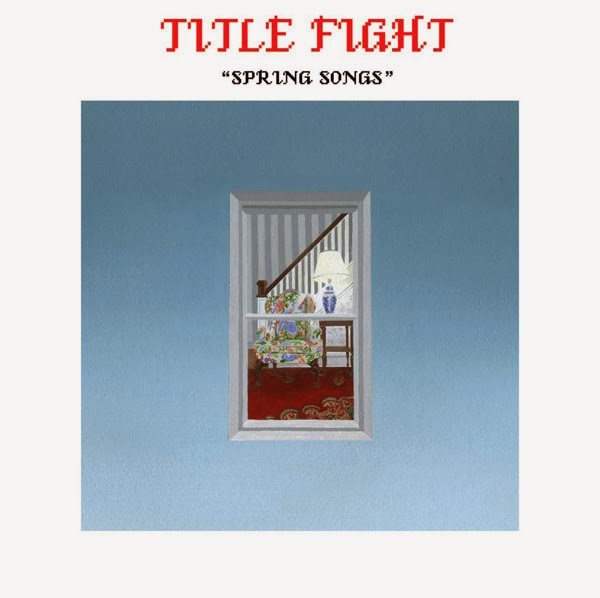 It's all crafted so well with precision and care that if you weren't fan of Title Fight before, you'd be dumb not to check this out for the awe-striking progression. As someone who found Floral Green to be a little repetitive and lacking, this one blew me away. Go buy it and prove me wrong. You can't.